Type K/K Bags. Filters to keep your Miele Universal or Little Giant upright performing well with improved air flow. Box contains 5 White IntensiveClean Plus Bags with Black Mounting Collar, 1 Electrostatic Secondary Filter and 1 Super Air Clean exhaust filter. 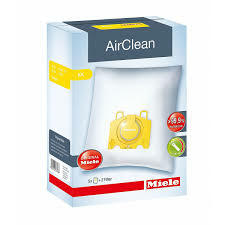 These Miele IntensiveClean Plus bags are an improved version of the former Miele IntensiveClean bags #05588950. Constructed with an intricate web of three-ply random-spun polymer fibers, far more tiny particles and allergens are retained than with conventional paper bags. Air flow is also improved significantly, especially as the bag fills.